Our week in Wisconsin was wonderful. Laura's first plane trip wasn't exactly a disappointment as much as ninety minutes of nothing, each way. We departed in dense fog, we returned in dense snow. Our trip home was delayed so long by two de-iceings and concurrent closure of the Milwaukee airport for runway plowing I was afraid the flight would be cancelled. It was merely late. Pilots want to be home as much as passengers. If you've been here a while, you know Pat and Ann. They help people and rescue dogs. The former is their nature; the latter came their way their first winter in Wisconsin, twenty years ago. 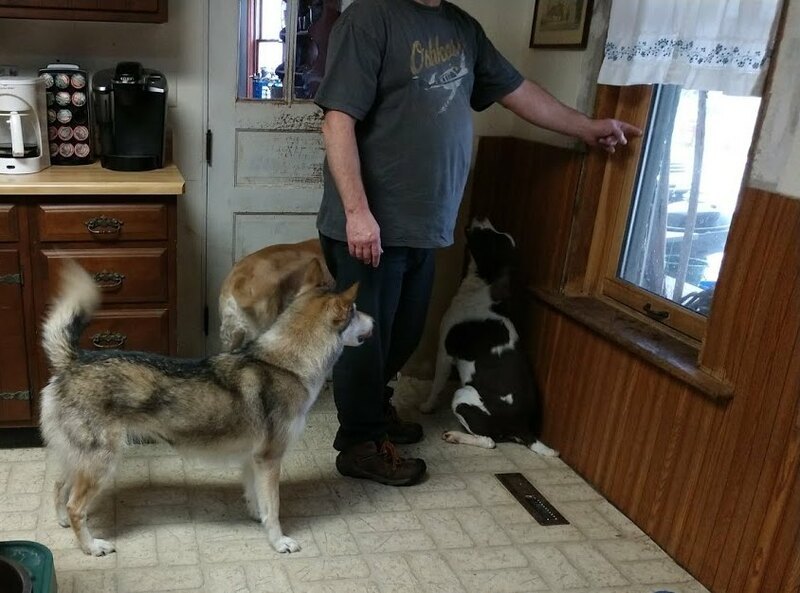 Pat realized half a dozen huskies kenneled behind a barn he passed going to work actually were abandoned, no humans left. A veterinary friend helped him free the dogs and move them to a kennel erected at Pat and Ann's old farm. The huskies had several more good years, though never socialized. The last year they presented their saviors a litter of pups, one of whom survived. Fluke became a house dog, and has been gone only a few years now. All the dogs in the house learn their place in the pack. Some go to the outdoor kennel, which has become an eight pack unit with insulated dog houses and heated water bowls. 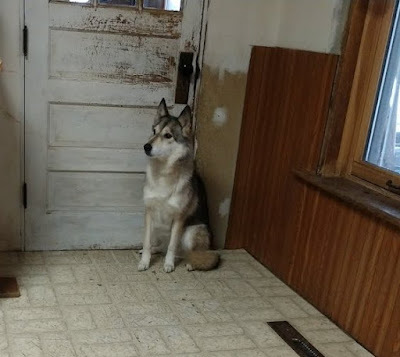 Let's just say they failed at living in the house, though some Malmutes, huskies and Samoyeds only came in to say hello and gratefully return to Wisconsin winters outdoors. Probably my best group portrait of some house residents. Back left, Shotzy, back right, Chica. 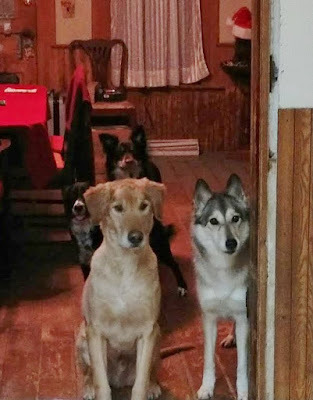 Front left, Sawyer, front right, Freija. 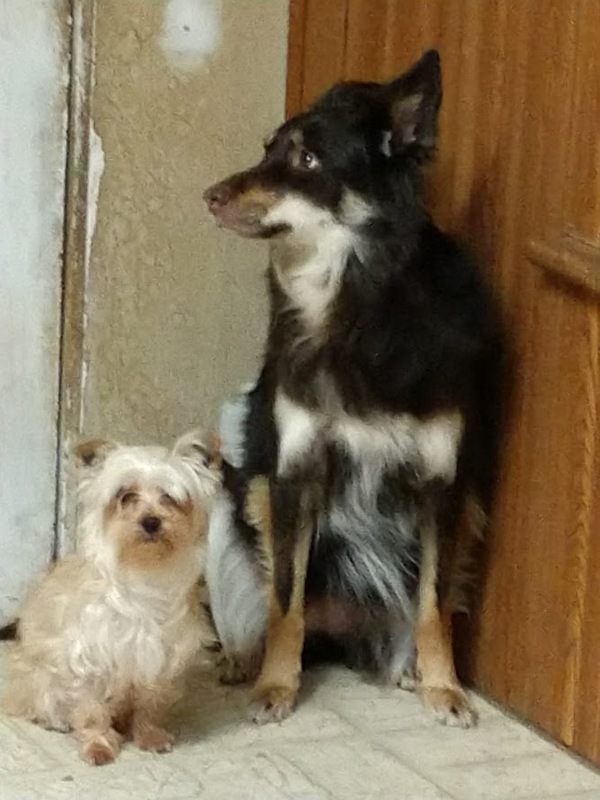 Shotz and Chica are border collie mix. Sawyer is a shaved to the scalp golden, Freija is a husky mix. For the last ten years Pat and Ann own a commercial kennel and grooming business. 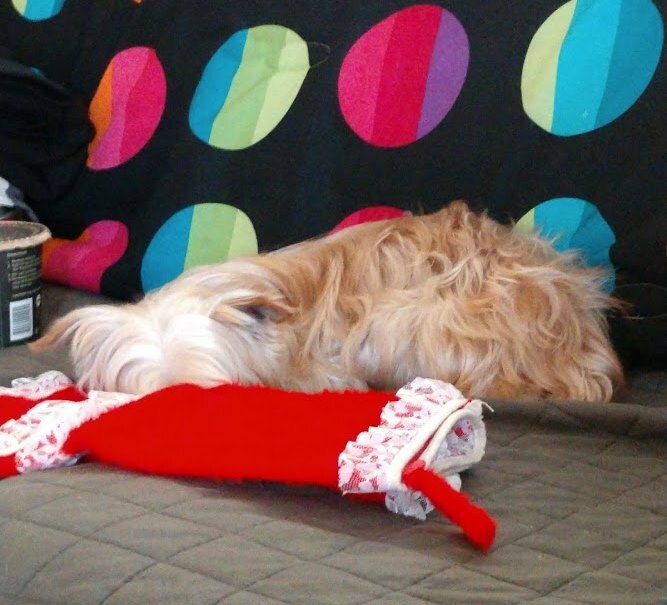 Shotz was boarded there, and abandoned by her owner. Freija was found along a road several years ago, injured and pregnant. She was rescued by the ASPCA, but failed several adoption attempts. Saved by Pat and Ann. Sawyer is a golden retriever with textbook ADHAD to an elevated degree. He has flunked out of three aide dog schools. According to Pat, he is brilliant and unfocused. The last school that sent him back was Cadaver Dog school. He could find them, call for assistance, then leave to chase a butterfly. Chica is an ASPCA reject. Pat and Ann occasionally fostered for them. Chica was returned from her adoptions. 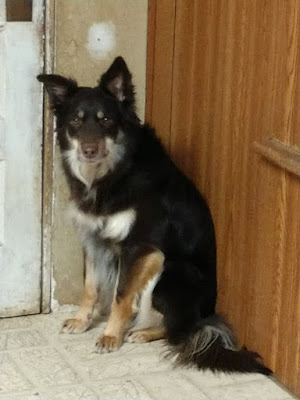 Ann says "she's a border collie; what do they expect?" Of course she herds anything that moves. Here we have Henry, Sawyer and Freija. Henry is a full bore Springer. Another "what did they expect?" story. An old couple owned a Springer from their younger days. He grew old and sedentary; they thought they'd get him a companion. They forgot their old guy was strong and on the go in his younger days. They couldn't handle the new pup. Henry is probably five or six now, and I make sure I am fastened to something when he comes by. Here are Chica, who you're already met, and Shikera, a Yorkipoo. She's likable, but I've never grasped the attraction. Shikera also was not reclaimed from boarding. All these dogs are in constant re-training, through no fault of their own. In the picture with Henry, Pat is giving a hand signal to one or the other of the dogs. The dogs earn their place in the home and the pack through good behavior. It is their misfortune the original owners acquired them for the wrong reason. It is their great good fortune Pat and Ann will see them through to the end, or find them a suitable adoptive family. Pat and Ann used to say to the dogs, five hundred dollars and you're gone. Do you remember the beautiful silver husky, maybe five years ago? He had osteoarthritis at a young age, broke a hind leg that did not knit well. Eventually it was amputated. Pat or Ann helped him up and down the steps for another year or two. The ledger pages apparently disintegrate at five hundred dollars. If you take in an animal, the responsibility is until death do you part. Shikera spent the week with Laura, on the sofa, while Laura and Pat watched (or re-watched) Pat's extensive collection of everything cinema. Miscellaneous left over dog pictures. I never had a head on opportunity with Henry; always in motion unless commanded to sit. I never got in front of him. He is fifty pounds of muscle and steel, waiting to be sent on a job. Have a wonderful day and night tonight Joanne, and I wish you much happiness in the year of 2018! I like dogs in theory, but we haven't had one in years, too much work. A cat is easier. Those two in my photo were walking Edinburgh city; certainly some Chow with those tales, but not pure - could be some Siberian in there too. They are much like my friend Deborah who is active in dog rescue and who also has a pack of dogs at her home as well as fosters other dogs which she and her husband usually end up with if it isn't adopted out. I forget how many in her pack currently. pack life, she refers to it. my main misgiving upon keeping this little rat terrier that was abandoned is that I knew she was a high energy dog and it seemed the last thing I needed at 65 but she has kept me moving. I have nothing but admiration and respect for people who rescue animals. It's a tough job. All those dogs are truly fortunate! We could hitch up Henry with our Einstein and Bunter and have a unicorn turn out pulling a dog cart! Bless the bunch of you for loving and caring for those darlings. Great photos of some absolutely beautiful dogs. Thank God there is a someone (or someones) who will love and care for them. Glad to hear you and Laura made it back safely and that you had a great time away. Happy New Year! And yes, an animal is for life. And repays that care with dividends. I hope that your coming year is less challenge filled and happier. You are a blessing and an inspiration in my life. God bless Pat and Ann. I'm glad you and Laura had a good week and that your flight wasn't canceled. Such great people, Pat and Ann. Beautiful dogs. Love this post, Joanne. Happy New Year. Pat and Ann are wonderful people doing a great job. 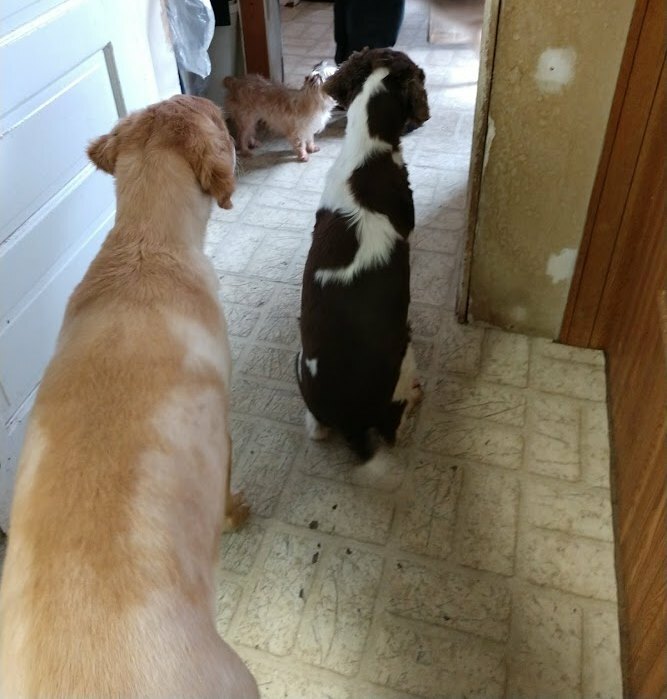 I've never seen a shaved golden retriever, was there a reason for the shaving? Matted hair perhaps? they are beautiful dogs. Chica reminds me of my Mad Max, a border collie german shepherd mix. Sawyer wandered through a patch of burrs, in search of who knows what, and through the same burr patch when Pat called him back. His hair is fine and silky and had thousands of burrs tangled in. He got a hair cut. It is not always easy to take on rescue animals but is so rewarding. My son's dog is a rescue. She was abused and abandoned as a puppy. My son got her from a woman who had her for almost two years but could no longer take care of her. It took almost a year before Isabella began to care about my son. She now trusts him completely after six years. The strange thing is that she has learned on her own to know when my son's blood sugar is acting up. For a diabeti that can be helpful. Your friends are wonderful for what they are doing and the dogs they take in are lucky dogs. Bless your friends. It's not an easy job and not just anyone can do it. Those doggies don't know how lucky they are. Glad you had a good trip and got home safely. All the best in 2018, with health and happiness to spare. Welcome back Joanne, happy new year. This is so admirable. On top of good hearts, they have the time, space and funds to do their good work. What happy, satisfying, and busy lives your friends who rescue dogs must have. CUTE DOG PHOTOS. HAPPY NEW YEAR, JOANNE. ALOHA FROM HAWAII. Some dogs you hsve there - all of them look as though they could eat my border terrier for breakfast and still be hungry. Happy New Year! I loved your comment on Tom's Volvo blog - 'The mill can't grind with water that is past,' Never heard that quote before but it's really applying to my life right now. Love your doggy pictures. Happy New Year. Only the best for those whom speak for the ones with no voice. Hope the new year will be a great one for you Joanne. Thanks, Donna. It will be good. Hope to see more of you. What good people Pat and Ann are! My last dog died about a year and a half ago and I am not getting another because I don't think I could take care of one properly, but, oh, I miss him......I wish you a very good and satisfying 2018! Dear Joanne, what lovely human beings Pat and Ann are. Good to the very marrow of their bones. Like you and like Pat and Ann I feel that any animal who come into my home to live with me are family. We are responsible for one another until we die. Right now I live with Maggie (who's 9 1/2) and Matthew (who's 9) and Ellie (who's 11). Matthew was mistreated as a kitten and so it took over two years before he would let me smooth his fur. Ellie lost of dear friend--an older man who went into a nursing home. She grieved for nearly five years before finally jumping onto my lap and claiming me. Pat and Ann are inspirations. What a gift that they are in your life. Peace.